Leanring Journeys is a metaphor for how individuals, organisations and communities can learn together to generate greater value, more quickly for all stakeholders. We are living off legacy infrastructure – both social and technical – and it’s failing us. We have to do better for less. We need to generate greater stakeholder value through collaborative knowledge generation, more quickly through pro-active reflection on process and rapid feedback and sustainably, through establishing design principles to transfer and repeat success. Successful businesses will be those that can learn better and faster together than their competitors locally and internationally. They will innovate across traditional ‘silos’ and boundaries. Traditionally learning is something we do in a formal context where we acquire knowledge that may be useful to us in our (professional) lives. Traditionally applying knowledge is like following a script: it is logical, linear and focused on ‘objective’ data. It is ‘top down’ and flourishes in a command and control culture. We tend to focus either on the parts or the whole rather than joining them up. We tend to think via a prescribed framework and ignore our richer and grounded experience or the potential of the unknown. It promotes an academic/vocational divide and de-values ‘practical wisdom’. A mental model like this helps us learn efficiently and acquire knowledge that is readily shareable in a stable professional community. However, it becomes an obstacle when the professional community needs to adapt, change and innovate rapidly in response to uncertainty, risk and challenge – when the information needed to solve problems is not already known in advance. The complex technical, social and environmental challenges of contemporary life require us to generate new knowledge in new contexts from the ‘bottom up’, respecting and drawing upon, but moving beyond and across, existing funds of knowledge. To do this we need a very different mental model, one in which learning is a process of becoming where we collaboratively navigate towards an outcome which we can’t know in advance, making sense of rapidly overflowing complex data, guided flexibly by a locally determined purpose and design principles, open to both the unknown and to difference. Seely-Brown (2015) describes this sort of extended theory of learning as knowing, making and playing – in which playing is about permission to fail, rapid experimentation and leveraging intuition and imagination. It gets us closer to the sort of critical future work skills identified by the Institute for the Future that will be needed in the next ten years as the landscape of work is being reshaped by technology and globalisation. Systems thinking has made a very significant contribution to our understanding of how organisations learn because it provides a way of mapping the complex behaviour of organisations through the concepts of layers, processes and feedback loops (Blockley 2010). The roots of this approach date back to the middle of the 20th century when Forrester (1961) developed a way of modelling industrial systems based on physical flows, their respective accumulations and information-based decision-making which are determined through feedback mechanisms. Systems dynamic modelling is a way of understanding a system (or organisation) through the relationships between its multiple ‘hard’ and ‘soft’ processes and the interactions and feedback loops between them. Systems thinking has been substantively applied and developed in infrastructure industries, health, insurance, the military, government and more recently in education. The best known application of systems dynamics and systems thinking to how an organisation learns was made by Senge (Senge 1990) in ‘The Fifth Discipline’ in which he argued that organisations are the product of how the people in them think and inter-act with each other and with the technical and physical processes for which they are responsible.Systems thinking is an approach that enables a view of the whole as well as the parts – a holistic and transdisciplinary perspective which is crucial for leadership although sometimes challenging to ‘reductionist’ mindsets . The critical link between learning and systems dynamics is in the idea of feedback loops. Feedback loops emerge from the interactions between processes in a system. They are the raw material of learning opportunities because, essentially, in the context on infrastructures a feedback loop is a flow of information or energy that invites a response from a human being (or from a machine that a human being has designed) and/or the natural environment. Feedback loops may be within the focus of attention of the people in the system or they may be out of focus. This will depend on their degree of awareness and capacity for understanding and developing their learning to learn capabilities – or learning power – their ‘mental models’ and the alignment between their personal purpose and shared purpose of the organisation. It was feedback structures and their cause and effect dynamics that enabled Senge to identify twelve ‘archetypes’ or recurring, often negative patterns of organisational behaviour. His hypothesis was that the leaders in a learning organisation will ‘see’ these patterns and respond and adapt to them in order to reduce their impact and thus improve productivity and service. Responding productively to the flow of information and energy that confronts each of us over time is a critical challenge for human society in the digital age. Knowledge is increasingly about ‘flows’ and ‘networks’ rather than ‘stocks’ (Seely Brown 2015 ) and in some cases the shelf-life of newly-learned skills and knowledge has been argued to be as low as 5 years. Learning power enables the human being to regulate this flow of energy and information over time – how a person identifies, selects, collates, manipulates and responds to data of any sort – in order to achieve a purpose that matters to them. People are complex systems in their own right and learning power is an embodied and relational process – brain, mind and bo dy are inter-dependent and interact with their environment and their history (Siegel 2010, Siegel 2012). A recent analysis of 15 years of data covering h ow people describe themselves as learners suggest that learning power consists of three distinct structures. Firstly, a set of ‘active’ dimensions which include ‘mindful agency’ as a core factor that is predictive of creativity, curiosity, sense-making and hope. Secondly a relational component – a sense of belonging to a team or a social network and the capacity to collaborate with others in solving problems; thirdly, an orientation towards risk and uncertainty, in which one is open and ready to engage, evaluate and adapt, rather than being either dependent and fragile on the one hand or rigidly persistent on the other (Deakin Crick, Huang et al. 2015). The sheer complexity of 21c life and digitisation mean that the capacity to learn – to identify and adapt profitably to overwhelming flows of data in conditions of risk, uncertainty and challenge – is a critical skill for human survival and for leadership. For an organisation, it follows that the more stakeholders at all levels are able generate learning power, the greater the learning synergy that will emerge at an organisational level and thus the greater likelihood of the organisation’s ability to respond profitably to change and uncertainty. For example, take the marketing function of a large bank where the dividend of improved individual and team learning on a business transformation project could be significant. There may be over 300 professional staff and a significant annual spend, a high % of which is discretionary. It has a campaign-based environment with a wide range of performance possibilities for each campaign and an imperative to learn continually from each campaign and do the next one better. However, learning is all too often an ‘add on’ to core business processes rather than embedded in real work and companies often lack a language for planning and improving learning and objectively measuring learning outcomes and outputs. Typically, training budgets are underspent because people are ‘too busy with real work’. The term ‘Learning’ is tarnished and devalued by top down, mandatory courses done in the name of ‘learning’. The real difficulty in innovation in any business lies not in developing new ideas, but in escaping from the old ones (Keynes, 1935:8) An acquisition oriented approach to learning and development that focuses on logical, ‘objective’ knowledge often fails to contribute to organisational transformation. Learning has to be seen and enacted as a ‘silo busting’ (G. 2015)(G. 2015)) collaborative journey that departs from the status quo and leaps to a new, formerly unknown state, through the application of individual and corporate mindful agency. A learning journey is a dynamic whole and it has distinguishable sub-processes. It has a natural lifecycle and it can be collaborative as well as individual, personal as well as public. Learning journeys happen all of the time at different levels and stages. The more we are able to become aware of learning as a journey and able to intentionally design for it as a basic way in which we develop as individuals and communities, the more likely we are to achieve our purpose and to flourish. Purpose, or intention or desire is the first process of a Learnign Journey. It provides the ‘lens’ through which the individual or team can identify and focus on the information that matters. Articulating purpose is the first stage of the ‘meta language’ of learning — learning about learning. Without purpose, learning lacks direction and discipline and it is difficult to select from a welter of data the information that really matters and work that into an innovative solution to a particular problem. Articulating purpose is closely related to identity — its about a story going forwards and it provides the raw energy for the learning journey..
Learning Power: is the embodied and relational process through which we regulate the flow of energy and information over time in the service of a purpose of value. Mindful Agency is critical to the development of learning power — which operates within individuals and within teams and whole organisations. Learning Power can be inhibited by the culture and values of an organisation — or it can be developed. Positive learning relationships and a sense of belonging matter — as does the right degree of openness to risk, uncertainty and challenge. Structuring and re-structuring the information and data necessary to achieve a particular purpose or solve a particular problem is the third core process of Learning Journeys. Learning power helps with this. For example, curiosity is a necessary quality for generating questions — while the quality of questions asked is indicative of the potential quality of the solution. There are many different strategies for structuring and manipulating and representing knowledge. Performing is the outcome of a Learning Journey which achieves its purpose. It may be a product, such as a text, a business plan, a performance or a skill…its the culmination of a journey, the fulfilment of a purpose. A Learning Journey is an intentional process through which individuals and teams regulate the flow of energy and information (data) over time in order to achieve a purpose of value. It is an embodied and relational process, which can be aligned and integrated at all levels in an organisation, linking purpose with performance and connecting the individual with the collective. The learning power of individuals and teams converts the potential energy of shared purpose into learning and improvement and facilitates the process of identifying, selecting, collecting, curating and constructing knowledge in order to create value and achieve a shared outcome. In complex systems there are frequently conflicting purposes and the task of negotiating these is a critical leadership function. A single-loop learning journey describes the psycho-social processes which inform change in any domain. This can take place without any real understanding or meta-reflection on the process by the person unde rtaking the journey. 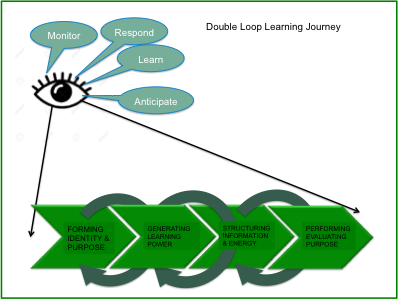 However when individuals engaged in a learning journey become aware at a ‘meta level’ about how and why they learn and use that information to improve the process and outcome through informed decision-making, they are engaging in double-loop learning. They are ‘doing’ the learning and they are ‘learning how to learn’ at the same time. This is more effective and efficient because the individual (or team) is able to mindfully ‘stand back’, monitor, respond, learn, anticipate – and therefore improve the learning process as they engage in it (Bruno et al 2015). 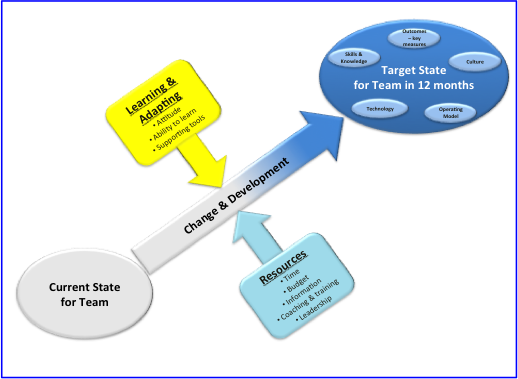 They are developing the‘resilient agency’ which empowers them to intentionally navigate change through a double-loop learning journey. They have the capacity, individually or together, to respond, adapt and strengthen themselves even in the face of adversity, shock, risk or c hallenge. When the contexts of learning change over time, individuals and organisations need to re-learn how to do and think as well as how to learn. 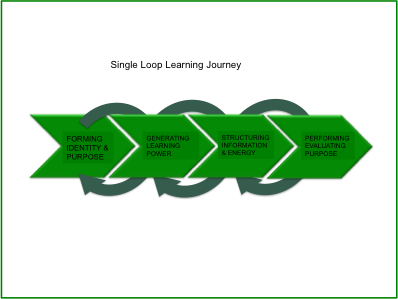 When learning journeys cumulatively mature in this way, individuals, teams or organisations are transformed in terms of identity, behaviour and performance, then this can be described as ‘triple loop learning’ which is characteristic of paradigm shifts. The following table identifies key characteristics of each process in the learning journey. While there is a sequence to these processes they are iterative and inter-related with each stage reinforcing and extending others. Problem structuring methods enable us to organise relevant information for example, mindmapping, systems dynamic modeling, agent based modeling, fishbone diagrams, dialogue mapping etc. To develop the relational, social and organisational infrastructure of an organisation so that individuals and teams become more agile, responsive and able to react productively to change and innovation. To design models which explore and explain stakeholder behaviour (how customers embody purpose, learning power, knowledge and performance) in order to more accurately communicate with stakeholder communities. To develop digital infrastructure to support self-directed learning and behaviour change at scale in particular domains i.e. mass education in e.g. climate change or financial competence. Learning journeys have differing lifecycles and operate at personal, interpersonal and organisational levels. They are critical to a rapid prototyping approach to organisational improvement where improvement protocols are designed on the basis on a careful, stakeholder inclusive, analysis of the system and the identification of a shared improvement aim. Both the fail-fast learn-fast imperatives of rapid prototyping and wide stakeholder engagement require employees with high levels of learning power and meta-learning capability. A learning journey has many stages, a start event, a finish event and many transition events in between. It is iterative and cumulative. It is focused on a stakeholder or customer task and is ideally aligned to organisational target outcomes. Each stage has many ‘next best actions’ and interactions and is framed by a meta-movement between purpose and performance. Stakeholders use personal learning power and knowledge structuring tools to navigate their journey. Stages have transition rules and interaction rules and stakeholders can be on many journeys at the same time. A journey can be collaborative or individual, simple or complex, high value or low value. Journeys follow stakeholders across whatever channels they choose and they are adaptive to individual behaviour. They cover different territories with domain specific-sets of knowledge and know how and they integrate knowing, doing and being. To be resourced at scale within infrastructure industries, learning journeys require a network infrastructure that accesses information and experience from a wide range of formal and informal sources inside and beyond the organisation. The individual or team relates to all of these in identifying, selecting and curating what they need in terms of content and ‘how to go about it’. This network infrastructure is part of a wider ecosystem with platforms that scaffold these relationships drawing on Cloud technology, Mobile technology, Social Learning and Curating, Learning Analytics for rapid feedback, ‘Big Data’ and Badges – to name some key analytic genres. Providing and servicing this Learning Infrastructure is a specialist task which is arguably the purpose of a ‘Living Lab’ or a ‘Network Hub’ in an improvement community. The network (social and organisational relationships) and the ecosystem (technical resources to scaffold these relationships) provide an infrastructure with permeable boundaries between research, policy, practice and commercial enterprise, facilitating engaged, transdisciplinary and carefully structured improvement prototypes. (NB this is quite the opposite to the siloed and balkanised systems in our current state). Such a ‘hub’ is sometimes described as a ‘Living Lab’ the purpose of which is to integrate engaged and user-driven improvement research with technology, professional learning and the wider R&D community. It provides, and researches, core Hub functions and expertise in partnership with the enterprises needed to scale and deliver learning services. Supporting such a Learning Infrastructure requires sustained attention to different types of expertise and resource development. The technologies and tools which support the processes of learning journeys through rapid feedback of personal and organisational data for stimulating change, defining purpose, knowledge structuring and value management. The idea of a Learning Journey is simple and intuitive. The metaphor facilitates an understanding of learning as a dynamic process. However it does represent a fundamental transition in how we understand knowledge, learning, identity and value. Knowledge is no longer a ‘Stock’ which we protect and deliver through relatively fixed canons and genres. It is now a ‘Flow’ in which we participate and generate new knowledge, drawing on intuition and experience. Its genres are fluid and institutional warrants are less valuable (Seeley Brown 2015). Learning power is the way in which we regulate that flow of energy and information over time in the service of a purpose of value – rather than a way of receiving and remembering ‘fixed’ knowledge from experts. Identity for millenials, is found not in ownership and control, but in creating, sharing and ‘remixing’ – in agency, impact and engagement. Value is generated in the movement between purpose and performance. Leadership is about learning our way forward together. Many of the ideas and practices discussed in this White Paper have been developed and applied in different contexts already, including some of the core technologies. What is required next is a way of integrating these ideas and practices in an authentic and grounded context, focusing on how the whole fits together. This will require a business model for all stakeholders which makes collaboration – not competition – the modus operandi. It will require all stakeholders to abandon ‘silos’ in favour of networks, and be willing to ‘learn a way forward together’ which inevitably also means permission to fail. In short, these ideas form a starting point for the resourcing of a Living Lab or Network Hub, supported by a partnership of core providers from academia, the infrastructure industry and the business world of ‘learning professionals’.